Students in first and second grade created striking collages made from a variety of images similar to those designed by Henri Matisse. In reference to his paper cutouts, Matisse stated, “I cut paper, but I’m drawing with the scissors.” Matisse also called the collage process “cutting into color”. We looked at examples of Matisse’s Goldfish and many examples of his cut paper designs. First we painted some watercolor paper with watercolor paints in cool color and covered the paper with saran wrap while the paper was wet to get a fun, watery texture. Let this paper dry. Next, we worked with the background paper, creating blocks of color with some precut geometric shapes and glued them down. We also cut lots of organic shapes form colorful paper, in the style of Matisse, “drawing with the scissors”. Some were glued to the background; some were saved for using in the composition later. To make our goldfish bowls, we folded an 8 1/2 x 11 inch sheet of printer paper in half (either lengthwise or crosswise) and drew half of a vase starting from the folded edge to create a symmetrical template. Then this shape was cut out to create a shape to trace. 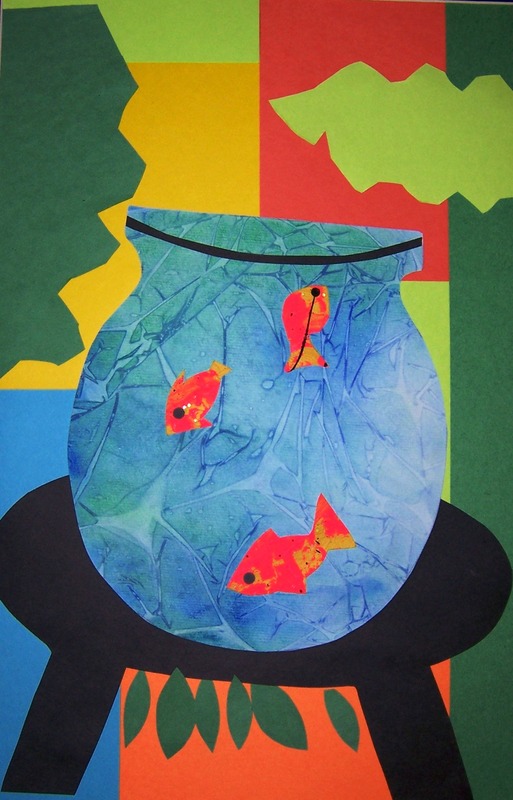 Trace the goldfish bowl template onto the back of the watery painted paper and cut out the goldfish bowl. I had some templates to trace for the stool and students cut them from black paper. We also cut goldfish from some collage paper that had been painted for another project. The last step was assembling the many elements of the collage. This was when kids really got to use their mad artist skills and try lots of different compositions before gluing down the end product. Enjoy Simon G. and Leah’s collages! 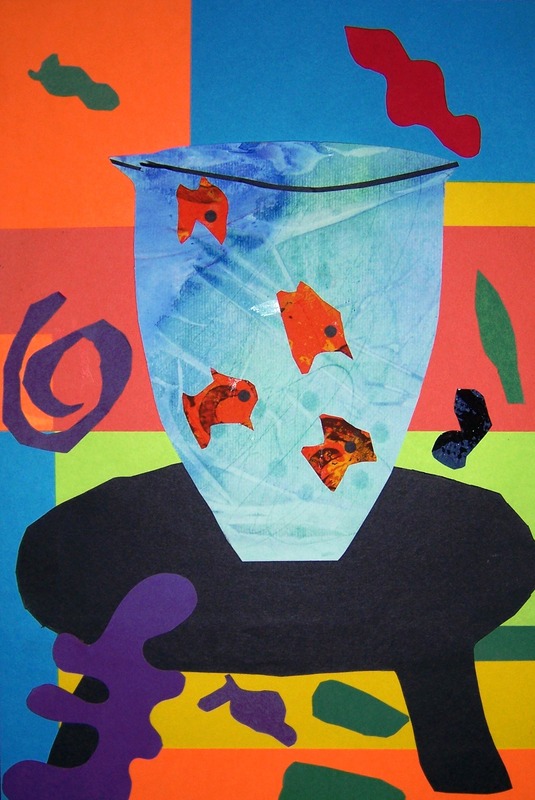 This entry was posted in Collage, First Grade, Still Life and tagged color blocks, matisse collage, matisse goldfish, organic shapes by Wilder Paint Splatters. Bookmark the permalink. Love this! did you let the watercolor dry with the plastic wrap still on it, or take it off with the paint still wet? How long did you keep the saran wrap on or was the saran wrap part of the finished product?? Thanks! Hi. Just let the paper with the Saran Wrap dry and take it off. The Saran Wrap on the watercolor paper as it dries creates the patterns. Please put this work on an kids art website to raise money for the school. I’d love to buy a print. If you contact me, I can find out the name of the site my kids’ school uses. Thanks, I would love to know the name of the site. I teach 50 minute classes. How many class periods did you take to do this project? It took 4 classes. My classes are 45 minutes. I will have to try to connect with the child’s family to get permission. In the meantime, you do not have permission to use. Could you please do it? I will like to use the collage in the right side of your page. I wrote to you because so is requested in the site. I will ovbiusly include the name of the child. If you send me your’s, the copyright desk of the academic editor will be in contact with you. Time is over…what happen whit the permission? Hello Milly. Thank you for your interest. I have contacted the student’s family and am waiting. That’s all I can do. Sorry.